While I know traditionally pesto is made with pine nuts I much prefer the taste and texture of pecans, so here is my version of homemade pesto. In a food processor using the blade attachment grate the Parmesan, do this by processing for approximately 10 seconds. When grated place in a separate bowl. Next put the pecans and roughly chopped garlic in the food processor with the blade attachment and process for about 10 seconds. Add the basil leaves, salt and pepper and process. With the processor still on add the olive oil until the pesto is completely puréed. Finally stir in the grated Parmesan. 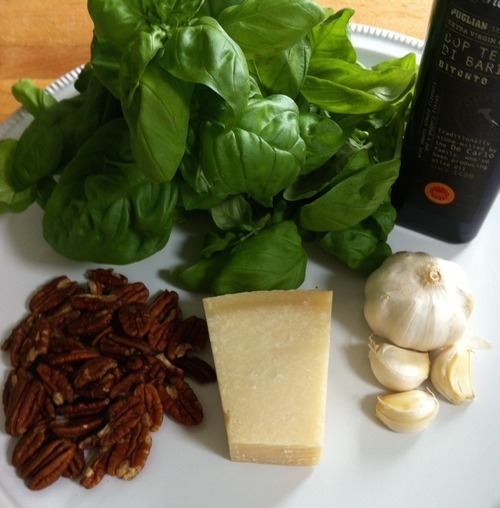 Serve with pasta, or add some more olive oil to make a delicious dressing for salads. Use right away or store in the fridge or freezer.